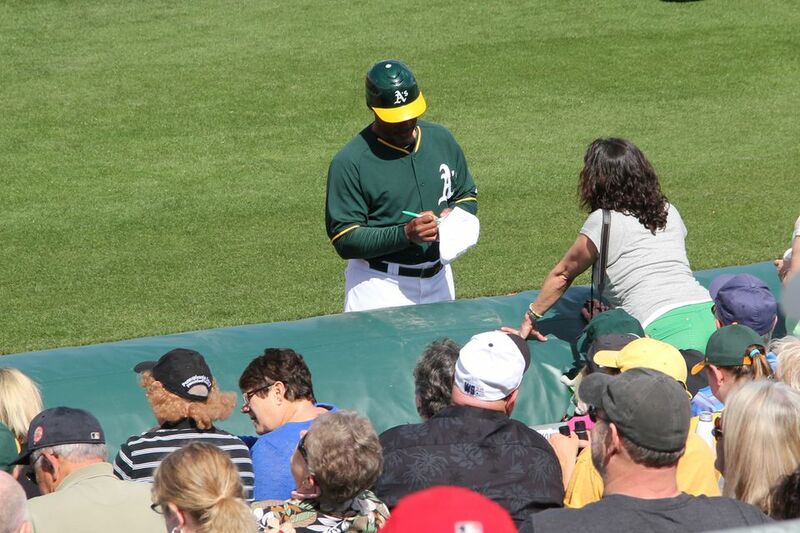 The Oakland Athletics play Spring Training Baseball at the renovated Hohokam Stadium in Mesa. This is a new location for the team since 2015, moving here from Phoenix Municipal Stadium. How do I get to Hohokam Stadium? Here is a map showing Hohokam Stadium. This stadium is not accessible by Valley Metro Light Rail, unless you like a long walk; it's about two miles from the Center/Main station. What is the schedule for the Oakland Athletics Spring Training games? The Athletics Spring Training schedule for the 2016 season is shown below. Scroll down on this page to get details on buying tickets. All games start at 1:05 p.m. or 1:10 p.m. Arizona time unless otherwise stated. These games will be played at Hohokam Stadium unless otherwise stated. This schedule does not include games that are played outside Arizona. Oakland A's Spring Training schedule dates and times mentioned are subject to change without notice. Since the times of games may change until the schedules are finalized, check game time before you buy the tickets. This schedule is tentative until Athletics Spring Training tickets go on sale. These are the Spring Training games that will be played at Hohokam Stadium. To see the entire Cactus League Spring training Schedule, see the Month-at-a-Glance page. It will be updated when all team schedules are announced and final. Monday, March 20 vs. Diamondbacks at 7:05 p.m.
By phone through Tickets.com at 877-493-2255. In person at Hohokam Stadium Box Office. If they are sold out, from a reputable ticket broker like TicketsNow.com. If they are sold out, from scalpers/ticket exchanges. Note: beware of fake tickets! Start here to see photos of Hohokam Stadium. These images are of the old stadium. After the season starts, I will replace those with new photos of the renovated ballpark.